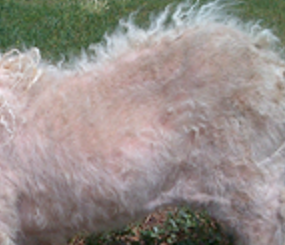 A number of farms have reported Angora goats with significant hair loss. A crusty tan brown colour on the skin surface can be seen and when the hair is pulled it easily ‘breaks’- pulls away at the skin surface. In cases where importantly red and blue lice have been ruled out we have done cultures to determine the cause of this hair loss. 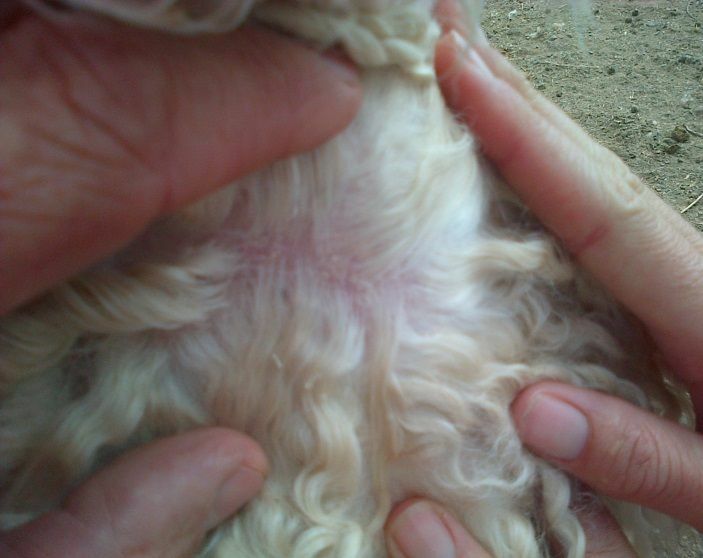 On 4 farms where this hair loss has occurred in Angora goats we took hair pluck and skin scraping samples. These were examined and cultured. All 4 cultured positive for Dermatophilus congolensis. Dermatophilus congolensis is seen more in sheep where it causes ‘klont-wol’ . In goats it is often associated with wet hair from dipping. Hence one of the reasons farmers in the past added Zinc Sulphate to dip tanks. The infection is often seen as crusting lesions on the ear margins of goats. Contact between goats especially when wet such as after rain or dipping. Contact with contaminated plants or insects. Prolonged wetting of the skin causes disruption of the sebaceous film on the skin rendering the skin susceptible to infection by dermatophilosis. The zoospores occur mainly in the crusty scabs which when wet are released. The number of viable zoospores decreases as the scabs dry. Hence these outbreaks of hair loss often occur after periods of rain, dipping, shearing or ear punching. Continuous wetting of the feet, the face and fleece when grazing wet pastures may play a contributing role. Wetting in addition to the activation of the zoospores may also transport the spores to other non-infected sites on the goat. Some goats may have crusty lesions remaining on ear margins and these goats may act as carriers. Any damage to the skin may predispose it to infection. D congolensis is a gram-positive, non-acid-fast, facultative anaerobic actinomycete. It has two characteristic morphologic forms: filamentous hyphae and motile zoospores. The hyphae are characterized by branching filaments (1–5 μm in diameter) that ultimately fragment by both transverse and longitudinal septation into packets of coccoid cells. The coccoid cells mature into flagellated ovoid zoospores (0.6–1 μm in diameter). To establish infection, the infective zoospores must reach a skin site where the normal protective barriers are reduced or deficient. Zoospores germinate to produce hyphae, which penetrate into the living epidermis and subsequently spread in all directions from the initial focus. Hyphal penetration causes an acute inflammatory reaction. Natural resistance to the acute infection is due to phagocytosis of the infective zoospores, but once infection is established, there is little or no immunity. What causes the hair loss and crusty lesions? The branching filaments of the dermatophilus invade the living cells of the epidermis of the skin and the sheaths of the hair follicles where extensive proliferation of the organism occurs causing hair loss. The organism causes inflammation and exudate resulting in the crusty skin associated with the hair loss. Crusting lesions against the skin can be seen. Flecks of yellowish- white to brownish grease or crusts. Acute lesions: erythema, exudation and flecks of yellowish –white to brownish grease or crusts. In severe cases large amounts of exudate and scabs are formed. The sticky exudate can dry and glue staples together and hence the name ‘klont- wol’ in sheep. 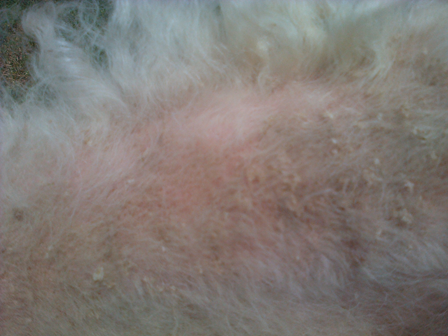 Chronic lesions: in sheep are seen as lumps 30-40mm in diameter. Bathing of crusts with warm water, topical disinfectant (eg. chlorhexidine). Organisms are susceptible to a wide range of antimicrobials: erythromycin, spiramycin, penicillin G, ampicillin, chloramphenicol, streptomycin, amoxicillin, tetracyclines, and novobiocin. Two doses of long-acting oxytetracycline (20 mg/kg) 1 day apart have shown to be curative in 100% of sheep, compared with cure rates of 80% in sheep for a single dose. Keeping the goats dry is important. Zinc levels should be checked because outbreaks have been associated with zinc deficiencies. Dermatophilosis can be transmitted to people. Direct contact with an infected animal can lead to infections on the hands and arms. Affected animals should be handled with gloves, and thorough handwashing with an antibacterial soap is recommended after contact with an infected animal.